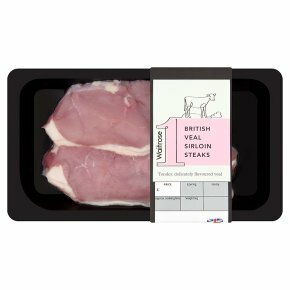 Tender, delicately flavoured veal from one specialist farmer working to the highest animal welfare standards. Age on slaughter up to 8 months. Our veal comes from one specialist British farmer, who works to the highest standards of animal welfare. The meat is fine-grained, with a subtle, delicate flavour. Pan Fry. Time: Rare 4 - 6; Medium 6 - 8; Well Done 8 - 10. Place in a preheated frying pan, turning once during cooking time. Ensure the surface of the meat is thoroughly cooked. Once cooked, cover with foil and allow to rest for 5 minutes.